Carriage mode with full recline gives infants a comfy ride from birth. Reversible seat allows baby to face your or explore the world, and reclines in both forward and rear facing positions. 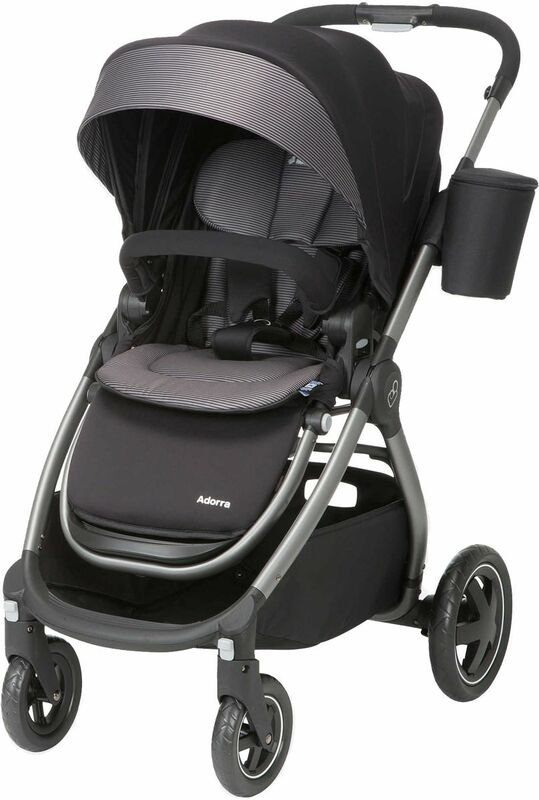 The adjustable handlebar makes strolling comfortable for parents of all heights. The Adorra folds down easily with the seat facing in either direction. I�€™m so excited about my purchase! The stroller was way easier to use than I anticipated and it�€™s much more sturdy as well. I chase the black metal finish bc I�€™ve had a friends complain that gray finish shows scratches very easily. So far so good! We really enjoy the drink and pouch accessories that come with it as well as the ease in in transition from car seat, seat and bassinet. My mom is also excited to finally have a stroller that doesn�€™t stress her out when taking grandkids to the Zoo. Great look. The only downside is that�€™s too heavy. This stroller is 100% a must have !! ProsIt has so much room . It?s easy to set up I can?t never instal anything and I done this myself within probably 5 minutes or less super easy .. the storage basket underneath is super big . 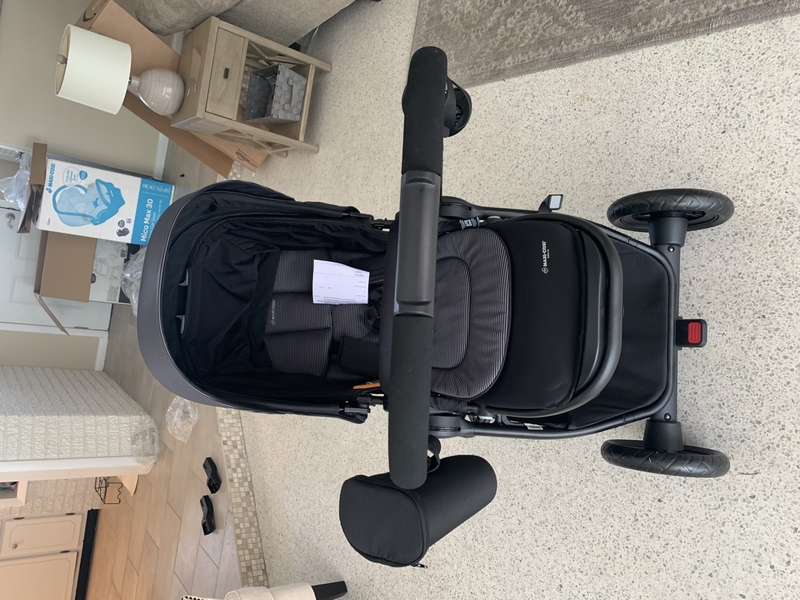 The stroller is super smooth to push .. the seat is super easy to take off/put back on .. also this stroller comes with the adapter for the maxi cosi 30 infant car seat which I thought was great !! ConsI don?t really have anything to say with a con other than the fact that I had a very hard time trying to figure out how to fold this stroller .. I just bought this stroller and so far so good. It's super comfy and the basket is huge. Only downside is that is heavy and takes up alot of trunk space. But other than that its perfect! This stroller looks good and it's very confortavle for the baby. It's difficult to maneuver as it is difficult to turn. I don't recommend it to a mom who has had a cesarean. Closing/folding the stroller is a hassle and very time consuming. Honestly my $60 grace travel stroller drives way better. I have only had this stroller a short period of time for my second child and already wish that I had it for my first. AlbeeBaby came through for me on the customer service side when my original order (different color) was out of stock. I have used the stroller as a bassinet at home and love the option for the baby to lay flat on the go. The storage is large and easy to get to. I wish the stroller was more compact when folded but not a deal breaker. ProsBeautiful and looks like more expensive strollers. Comfortable for infant but room to grow. Large storage. Adjustable handle. Rear facing option. Flat option is great but also does not click in, allowing for a little movement in the stroller to sooth baby. Features are easy to use. ConsNo easy to turn. Stroller still large when folded, not sure it would fit through airport X-ray machine. Im Very Pleased With The Item! Im very pleased & im very satisfied with the Item! and yes i would recommend it. I had the Dana for 2 and loved the way it rose and Kids were so comfortable. Bought this as a gift. I know will be loved! Honestly, before I even ordered this item I had second thoughts because the price was really good for this amazing stroller. I even researched albeebaby because I was really surprised about this website. So then I just wanted to give it a try and order this stroller, even tho I had second thoughts. After I placed my ordered I haven't received my tracking info so I Automatically thought that I made a mistake. But after 3 business days my stroller came. A-MA-ZINGGGG!!! I was surprised and I was extremely shocked about the quality. I honestly recommend this to everyone! It's an amazing stroller with amazing features! I do not recommend it. The front wheels get stuck and it is very uncomfortable all the time. This stroller has very nice look and is very expensive but is not durable at all. My front wheels gets locked all the time. Im unable to enjoy a walk outside. After one year this stroller is trash. And by that time the warranty is up. The front wheels get stucked all the time, I just can't have a nice walk with my baby. All the time is a stress!! I had this stroller not that long and I already had to change back tires, now the front tires just stop or get stuck!! The frame scratches so easy!!! The foam from the handle bars randomly came off when I would put the white foam piece around it in the back of the car. I am taking good care of the stroller but it's getting scratch marks so fast and the foam on the handlebars came off! This stroller is most definitely not worth the buy!!! I received this stroller as a GIFT and I wish I could take it back. It is a gorgeous looking stroller but major issues with the front wheels and the folding aspect. Firstly, the front wheels no longer turn after using it for the second time. It also locked when I was walking across the road on its first walk - I was panicking. Also, it is a very very bulky stroller to fold - sigh. 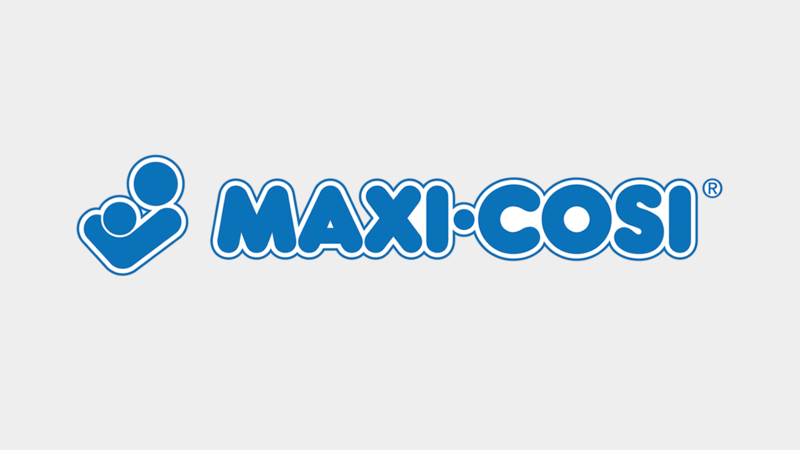 I have contacted Maxi Cosi for help on getting the wheels fixed - however if I could take it back and get a refund I would. This needs some small tweaks to the design to make it right. 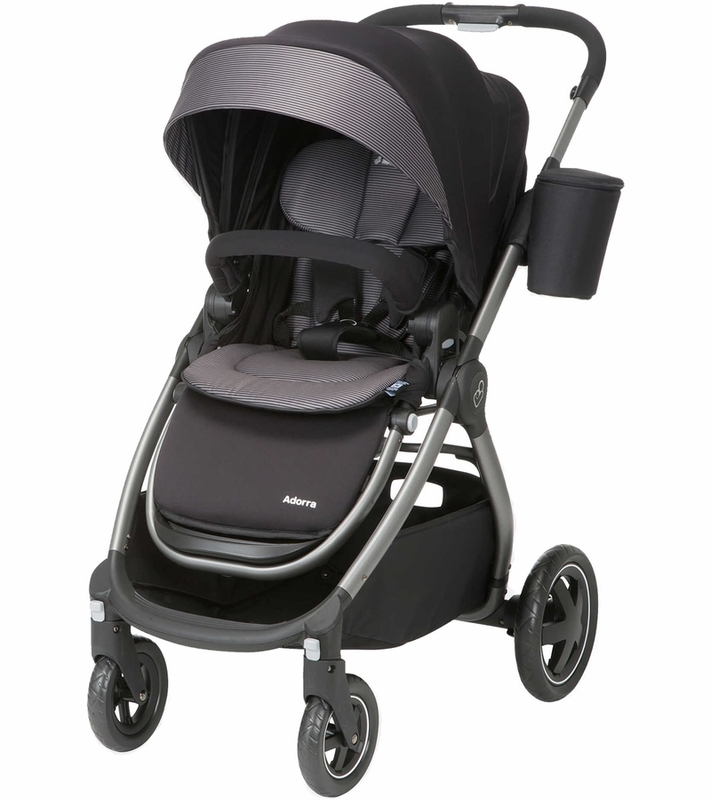 In other news, I have the Maxi Cosi Pria 70 and LOVE IT!!! They front wheels keep getting stuck. SO bad that I had to write a review. And this is the first! The stroller is very light and cosy. My sister loved how easily it runs. The latch system was easy to use. To connect the car seat to the base, you just pushed it to the base instead of having to hook it like some other travel systems. The car seat appeared very comfortable and padded with quality material. There was even an infant insert for extra comfort and support. The seat carry handle was nice because it was ergonomic and fit nicely in my hand. The instructions were clear, and it was easy to assemble. The base felt secure; however, it extended pretty far forward. With the handle downwards, the car seat took up quite a bit of room in our sedan. The front seat needed to be pushed far forward. That being said, it fit nicely in our SUV. The stroller was easy to put together. I liked the adjustable height of the handle. The single wheel lock was convenient. Folding it down was a little difficult to do though, and it could take a little practice. One of my favorite parts about the stroller and car seat is that they look nice and expensive compared to some others that I've seen. I also liked how comfortable and safe my daughter looked with all the padding around her. I participated in a market research study and received a product to evaluate the Maxi-Cosi Adorra Travel System. The stroller system was great! I love that the seat was easy to use and fold up and get in the car. 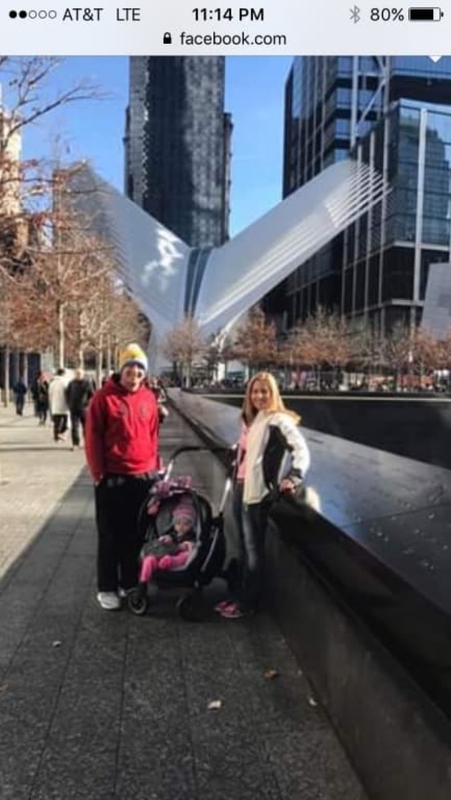 I also thought the stroller height was great. I love the gender neutral coloring as well. I participated in a market research study and received the Maxi-Cosi travel system to evaluate (the stroller and seat) - which was a HOME RUN! What a product! I LOVE IT! This travel system is amazing! It exceeded my every expectation. 5 Stars for sure and A PLUS PLUS! My infant was in absolute heaven with this comfortable and cozy seat. The last three times I brought my newborn babies home from the hospital, I kept turning around in my car seat begging my husband to hurry home for my little baby was not secure and comfortable (head leaning and too little for the straps) in the other brand seat we had. With the Maxi-Cosi, I didn't have to worry, my baby was secure and held nicely in the Maxi-Cosi seat. It was perfect for my newborn! I also have an 18 month old little girl which the stroller works perfectly for. I can lay the seat back and change her clothes or diaper anywhere... and let me tell you, with four kids and on the go every weekend - Disney, LegoLand, Zoos, Museums, Aquariums..etc. this was a perfect fit for us. The storage compartment on the bottom is HUGE! It's great for my diaper bag, purse, 3 kid cups and snack cooler... nothing falls out and everything fits nicely. This system folded up nicely, quickly and tightly. I could lift it easily (surprising, very light and extremely durable) and store it in the back compartment of our Honda mini-van. I love being able to adjust the straps easily and taking it apart to wash the seat was effortless... I always had my husband take apart the other brand because I could never figure it out. BUT with the Maxi-Cosi, I simply unhook and drop it in the wash machine. I have the Navy color and it is simply stunning (yes, I'm a "soccer mom" and very excited about this stroller - it makes my day - everyday!). The sun shades are made with a solid durable fabric. I HIGHLY RECOMMEND IT!! This system - car seat and stroller are a DREAM TEAM! I LOVE this stroller!!!! - A M A Z I N G!!!!! It does everything a new mom would want/need! Baby can face you... baby can face out and explore the world... in a car seat... sitting on its own... this stroller is great from newborn to older toddler! The storage on the bottom is very large and super easy to get to also! The only downfall that I see is that there`s not much storage for drinks/cellphone/mom stuff. Luckily I already had a stroller caddy that was perfect for it! I do love the bottle storage on the side though! Very convenient once you get used to us and stop hitting it on things ð This stroller also glides so smoothly! Very easy to maneuver and fold/unfold! Overall, this is a wonderful product for a new mom and definitely worth the money as it`ll last you a LONG time! I received the Maxi-Cosi Adorra Stroller as a sample to review. The stroller is used on my 4th child, so I have seen my fair share of strollers. The stroller not only looks and feels stylish, but can grow with my child since it holds up to 50lbs. I love that the seat can face you or face forward and that it fully reclines. This has been amazing for me to get out and walk on some of these warmer days while the baby naps. There is a huge basket underneath, a catch all bag on one size and a cup holder on the other. The cup holder is made for smaller cups and not the big mugs I use. I also like to use stroller bag clips to hold other items, but they don`t feel too secure on the handles against the holders. My husband likes that the stroller handle adjusts to his height when he`s pushing and I can bring it back down smaller for me. Sometimes his feet get caught on the brake when walking, but my legs are smaller and I don`t have that issue. The stroller folds up with the seat in either direction, which is nice, but is a little more bulky than other strollers when folded up. Overall this is a great stroller that I look forword to using as my child grows. Pros- This stroller has soft cushion padding and it is very easy to switch between the large seat and infant car seat. �‚ The ability to adjust the backrest to a recline position �‚ and the handlebar height is simple. �‚ The storage basket under the seat is much larger than my previous strollers- great for storing those extra blankets, water bottles, etc. �‚ The added bonus is the stylish look of this stroller! I love this stroller! Sometimes higher cost doesn't mean higher quality, but in this case it definitely does. It is so soft and comforting for my child. It is easy for me to maneuver and use on my own too. The car seat is easy to get in/out of the car and lock into the stroller. I also love the way the stroller can be used multiple ways as my child grows. It also makes me feel like my child is safe in both the car and stroller whenever we are using it. I should mention that I was sent a free sample to use for this review. I was provided a free sample of this system in exchange for an honest review. 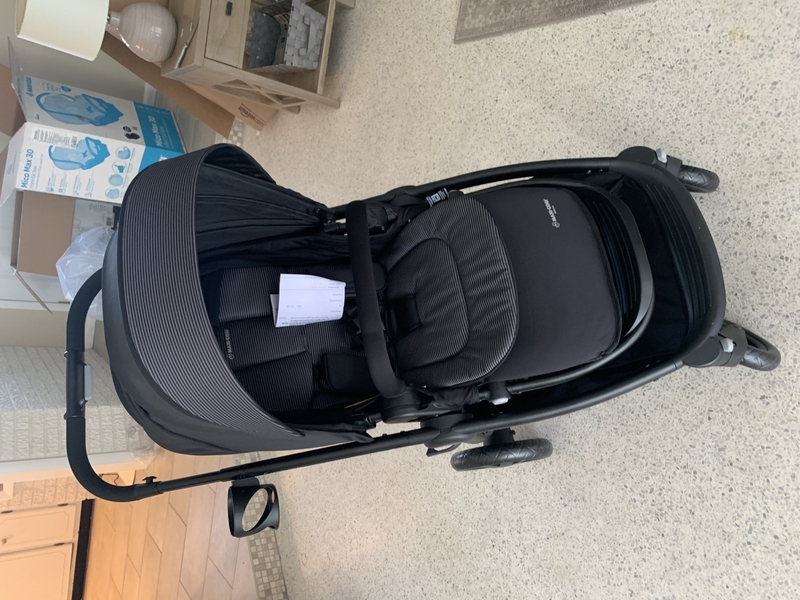 Overall, I found the Maxi-Cosi Adorra Travel System to be stylish, comfortable and well-made, though not without its flaws. -I live in a small town and I walk a lot. I frequently walk to the dry cleaners or the grocery store and a large bin underneath the stroller is a must for me. I found the bin on this stroller to be large enough and sturdy enough to easily carry groceries or other such items without causing it to be too heavy or cumbersome. - My daughter really likes to sit high up so she can look around while we walk. This stroller was a very comfortable height for her and allowed her to observe everything around her while we were out and about. 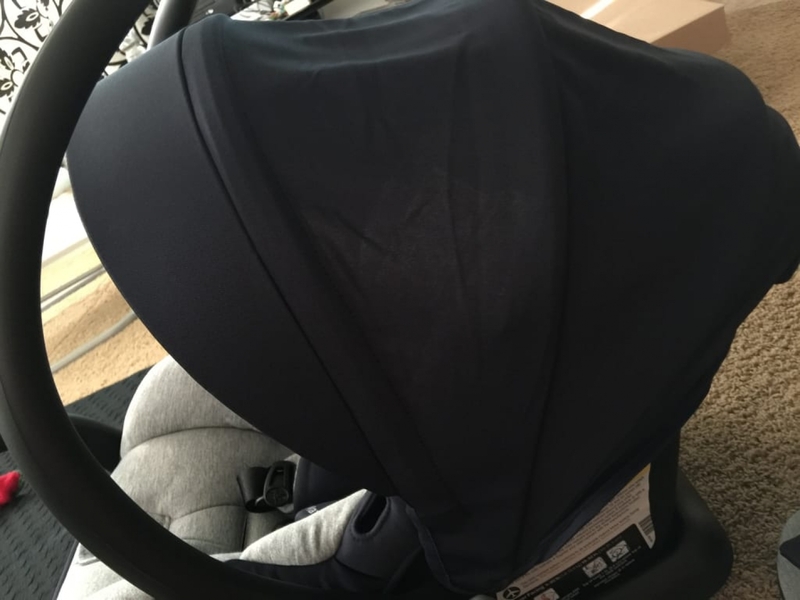 -The carseat is very soft and plush and everything seemed very easy to clean and care for. It is also a good weight. -The brake is very oddly placed. At first, I thought it would be convenient to have in the middle of the back wheel axle. However, when my husband used it, he would constantly step on the brake mid-stride. I should note, it didn`t happen to me, I suspect it has to do with the length of our strides and the size of our feet. But it was very annoying when on a walk to constantly be hitting the breaks. Great stroller for a tall parent! This is a great stroller for me to use, as I am a tall person! The adjustable handle is very comfortable. Baby sits up a big higher than other strollers we have used. The material is kind of like a jersey-type material. It looks fine now, but I am wondering if it will get "pills" on it as it gets used. The stroller is very sturdy, easy to use, easy to fold. The brake is easy to set and release. I received a sample of this stroller to use and agree to write a review. High end stroller, Rides really smooth. Love the fact that baby can sleep in "bassinett" type of layout. I love all of the attachments for bottles, etc. The bottom basket has a lot of room and it's sturdy. I really like the fabric feel , kinda like a jersey. The colors are unisex which was really important to us in case we decide to have another baby. 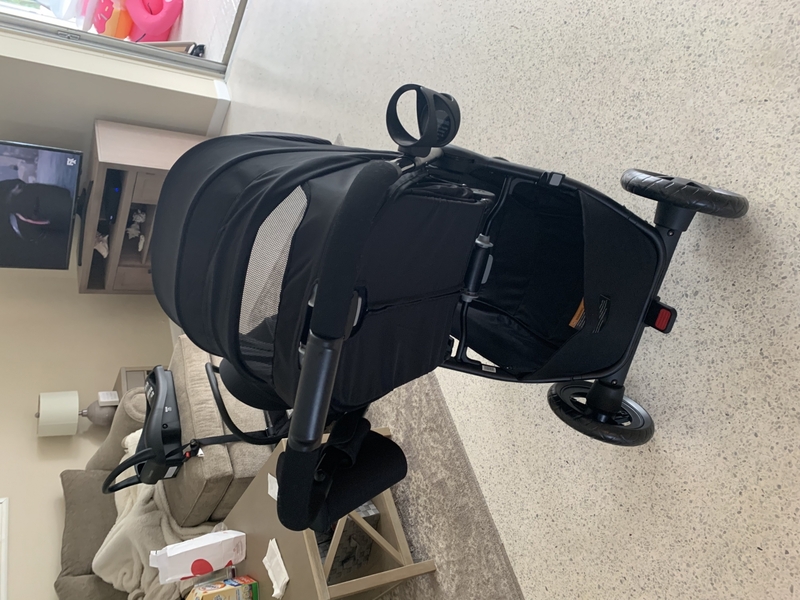 I have purchased many strollers throughout the last 10 years of having children, but this one by far is the sturdiest, smoothest ride and seems the most comfortable to the baby. I received a free stroller and car seat to review. Overall, I was very pleased with the product. For starters, the stroller had a ton of storage compared to other brands and styles that I've used. The car seat easily latched onto the stroller. The handles of the stroller were adjustable for height. My husband loved that feature. I was more focused on the storage. I could fit the whole diaper bag underneath! As for the car seat, the ease of installation was comparable to other brands we've used. It was also light weight and easy to carry. I was very pleased with this product. The quality and ease of use was superior to any other brand that I've used. I would definitely recommend this product to a friend. I received this stroller free of charge, in exchange for my honest review. The stroller was very easy to assemble compared to others I have put together. The instructions are clear and easy to follow. The stroller seat is very cushiony. It is very easy to switch the stroller seat from forward facing to backward facing. Removing the seat completely to use the car seat in its place is very simple too. My baby was very comfortable in this stroller. It is easy to adjust the straps to fit her correctly and it is easy to recline her seat after she falls asleep on our walks. I wish that I had been able to use the car seat to give it a full review. It is very well padded, more so than any of the carseats I`ve used with my 4 children. Overall, I am pretty impressed with the stroller. Sometimes strollers with that many seating positions can be a pain to switch around. This one is not! 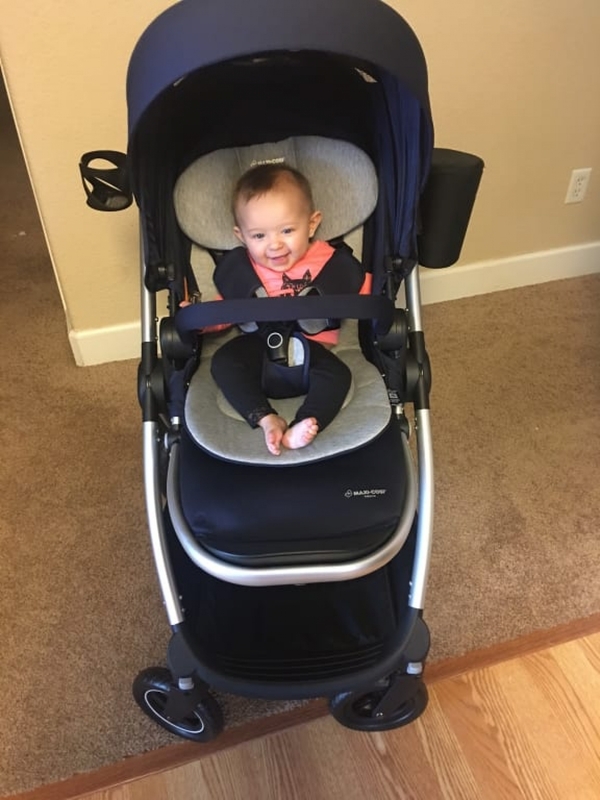 I received this travel system in exchange for a review of the product and I love it! I was in the market for a travel system at the time and I am so glad I received this! It has out performed for sure. When compared to other systems on the market, of the same price point, it is equal to if not a better option. My first impression of the Adorra Travel system was positive. The color was nice, and even though it was blue, I felt it was gender neutral. The size is not bulky and the stroller folds up surprisingly small. It appears well made and the overall look matches the price tag. Assembly was easy for me which is nice because I usually can not put anything together. The directions where very clear and numbered. Being easy to follow was extremely helpful for me. I put the system together myself in about 20 minutes. I am going to break down each component and then give an overall review of the system together. The infant car seat is soft and assembles easily. The adjustments for size are easy to make when needed. There is padding that seems comfortable for baby. The base is easy to install and the car seat clicks into the base well. My only complaint is the bar that is on the base. It gets in my way. The stroller I absolutely love! The main seat can be forward facing or rear facing, so I can see my baby on our daily walks. It reclines for napping and has an extended canopy to cover baby from the sun. The foot rest extends and goes down for when baby is bigger. The wheels lock and swivel for smooth movement when walking. The stroller fits in between isles nicely at the store. The stroller handle extends for taller people which my 6ft plus husband and son appreciate. You can also reach into and use the basket on the bottom while the stroller is in use. There is a cup holder and an accessory holder making it easy to take your keys and such. The straps adjust easily also. I received the Maxi-Cosi Adorra Travel System as a free sample to use for my daughter. I was able to take it through an airport experience. We only had the car seat and the stroller base. We arrived in New York and I was able to use the base to hold many of my items. We maneuvered in and out of all kinds of people on this travel. I also had people ask me about the stroller.The base is light weight, but mighty! The car seat is ergonomically balanced around female curves to help when carrying the base. Which all moms and dads know it gets heavy. The actual seat for the stroller is great in many ways. The several position options are awesome. I really love how she can face me and have the awning oversized keeps out the blazing sun. The buckle is a little challenging when she is a squirmy-wormy, but looks comfortable once shes all buckled. Overall, I recommend this product to parents' that like light weight and a well designed travel system. High Quality Craftsmanship, A Must Buy! I recently participated in a market research study and received this product to evaluate. When opening to assemble, this was not your usual suspect with hundreds of pieces to sort through and figure out. I pulled the instructions out and began assembly. I would like to first state that I am the WORST person to put things together. I was surprised by the easy assembly directions and how clear the instructions were, complete with pictures. I was able to fully put this stroller completely together without struggle nor frustration. The hard part was done, if you can even call it hard. As I was assembling the stroller, I noticed the incredibly soft, breathable cotton that the seats were made of. The stitching was neat, tight and there were no visually unappealing aspects of the stroller. I would have to say the materials used in this product are by far my favorite feature, and exceeds competitors products by a long shot. I placed my baby in the stroller and buckled her in. I tend to have a baby that gets hot and sweaty easily, so the soft cotton that the stroller is constructed of is a huge plus for us. She enjoyed her seat, it supported her well and there is even room to grow with an area that extends for their feet to lay straight out. Compared to another name brand stroller I have, I can appreciate the quality craftsmanship that was put in to this particular brand. There is a super nifty weather proof bag that hooks on to the side of the stroller for your cell phone and keys, which is great when you want them easily accessible to you. On the other side of the stroller, hangs a cup holder as well. This always comes in handy when we go to the mall, festivals or just for a walk around the neighborhood. The stroller is also very easy to disassemble, with one click it folds in half and is compact enough to stow away. This stroller highly exceeded my expectations and I would recommend this product with the highest compliments. I love this stroller. My daughter loves it also. More compact than most full size strollers when folded (smaller than the peg perego skate). Easy to use features.